If the colorful iPad add-ons shown at Toy Fair 2012 were any indication, your well-worn work companion will never get a moment’s rest again. Game makers have surrendered: If they can’t beat the iPad, they can join it with nifty add-ons and just have some fun. 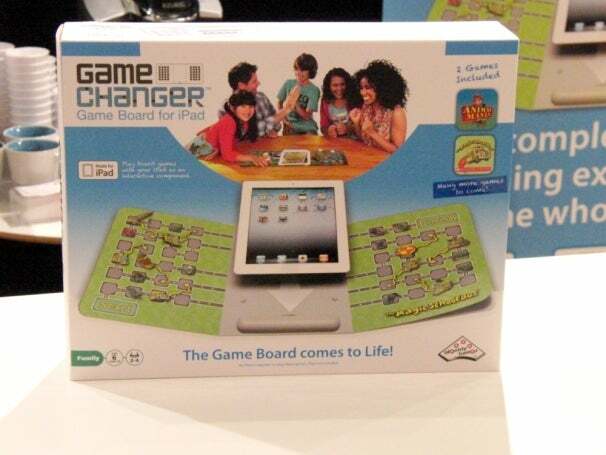 For example, the $60 Game Changer for iPad from Identity Games (see photo above) uses an iPad as the centerpiece of a game board which changes as you place plastic game overlays on it. The board has 24 pressure points on either side of the iPad, which slides into a cradle in the center. The Game Changer works with free games that can be downloaded from the iTunes Store. Once installed, users place the appropriate overlays onto the Game Changer and slide the iPad, which provides the necessary power, into place. Included are two Scholastic games: The Magic School Bus and Animal Mania. More titles from Scholastic and other game publishers are expected soon. Those old enough to have played Version One of classic Atari video games such as Asteroids, Centipede or Missile Command can share them with their children with Atari Arcade from Discovery Bay Games. 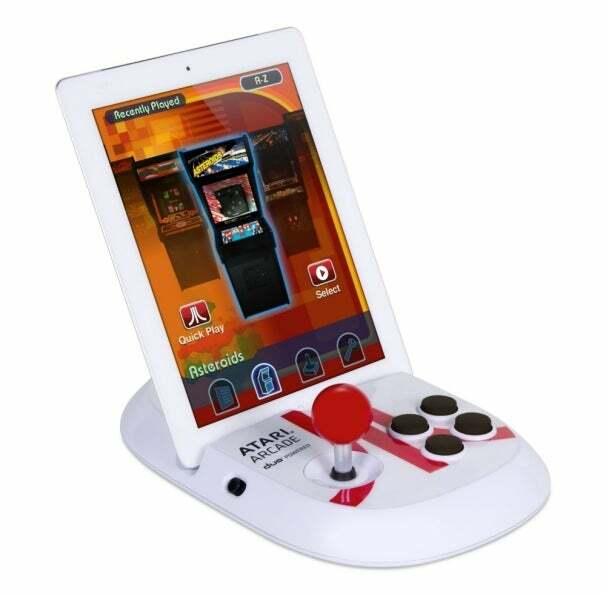 The $60 shiny white iPad dock has a large old-style gaming joystick and four programmable buttons, a design which saves wear and tear on the iPad screen while providing a similar gaming experience to the big-box, coin-operated video games which graced pizza parlors and bowling alleys in the 1980s. Downloading the free Atari's Greatest Hits app from the iTunes Store provides access to up to 100 classic Atari games. The United States Playing Card Co., which makes the familiar Bicycle-brand playing cards, showed off Jacked Up, a series of card games which put a high-tech twist on the classic games of War, Solitaire and Hearts. Some of the cards in the Jacked Up decks have QR codes which can be scanned by smartphones. The rules of the games change abruptly based on the instructions revealed when a QR code is scanned. Thus a losing hand can instantly turn into a strong one if the QR code changes the wild card while a game is in progress. The Jacked Up games require free iOS and Android apps. Aside from the cards themselves, each game comes with a small smartphone stand. 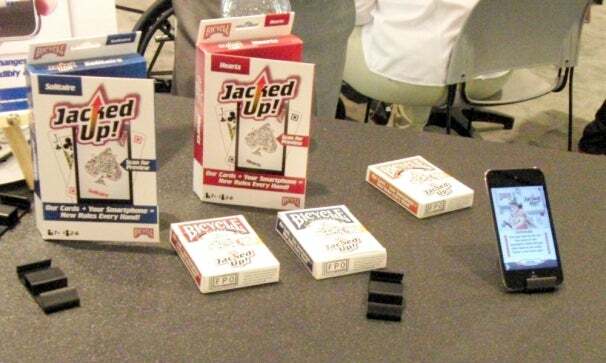 Jacked Up games will launch in April, reach stores in June and will retail for about $8. Lexibook, a French company that aims to provide budget-priced Android devices for every age group, showed off a prototype of the Lexibook Laptab, a convertible Android laptop/tablet which it hopes to sell for about $150. 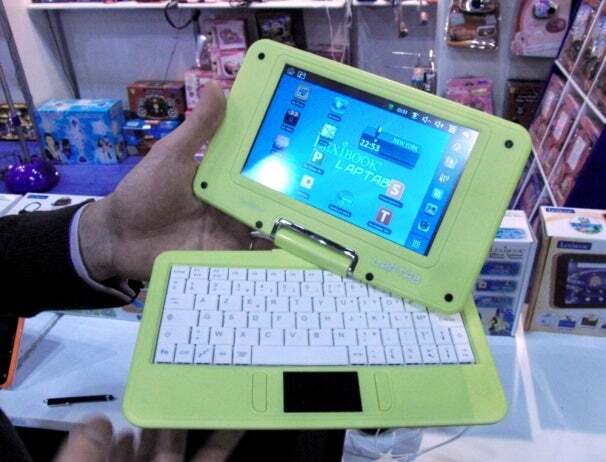 A swiveling screen allows the lightweight Laptab it to be used as a standard Android OS 2.3 touchscreen tablet or as a netbook with a full-size keyboard and touchpad. Side ports on the Laptab allow for the addition of USB-based accessories and removable memory cards. A company representative said the Laptab would ship with a Wi-Fi adapter, a Word-compatible word processor, and other Microsoft Office-compatible apps that would make it a reasonable low-cost choice for homework and other educational purposes. The appearance of so many youth-oriented tablets and tablet accessories at Toy Fair 2012 is backed up by recent Nielsen Co. research that found that 70 percent of tablet-owning families with children under 12 said their kids used the tablets themselves. Within this group, 77 percent of the children played downloaded games, 57 percent used them for educational purposes, and 55 percent used tablets to keep themselves amused while traveling. With Apple reportedly on the cusp of announcing a new iPad, the there’s at least one answer to the question of what to do with your old iPad: Hand it down--and get it ready for peanut butter smudges.